During my last few trips to Shanghai, something strange always starts happening around day three. I start to crave greenery. By day four or five, I’m starting to feel rather uncomfortable. When I’m whisking my way back to the airport – gazing out from the elevated highway or from the maglev on the urban sprawl – I realise what I’ve been missing. Nature. Sure there are little parks, and even some rather charming tree-lined boulevards in the old French concession. But these patches of greenery are so manicured, so small and controlled, that it reinforces the urban feel rather than bringing nature into the city. If you want to run outside – and there is only so much I can take running on a hotel treadmill – there are scant few options. Century Park, in Pudong, is the only moderately large patch of greenery. But I’ve never been a fan of having to take the metro to go for a run. But one morning I rose early and felt my legs twitching. So I slipped out the hotel and – not quite being able to face the metro all lyrcaed up – slipped into the back of a cab to Pudong. As we pulled up to the park, I noticed the stream of cyclist doing laps of the park in the cycle lane. Not commuter cyclists, but recreational cyclists, with expensive looking racing bikes – going as quick as they do around Regents Park in London. For a country where once cycling was so ubiquitous, it’s yet to go full circle and become cool again. When I jogged over to enter the park, I was met with a surprise. A ticket gate and a charge to get in. It was only 10 RMB – about a $1.50 – but I was pushed for time and didn’t want to break a note and end up with a handful of change on my run. So I made do with a couple of laps around the perimeter. Just me and the cyclists. But as I ran, that old Joni Mitchell song, Big Yellow Taxi, popped into my head. So on my latest trip to Shanghai, I vowed that after the working week I would leave the city and find some mountains nearby for a spot of trail running in the wilds of China. As usual, I’d not had time to properly think this through by the time the plane touched down in Pudong. But I had a few days of work to sort myself out. A few brief moments scouring a map and a flick through a guidebook over breakfast the next day – and I settled on Huang Shan. The Yellow Mountains. 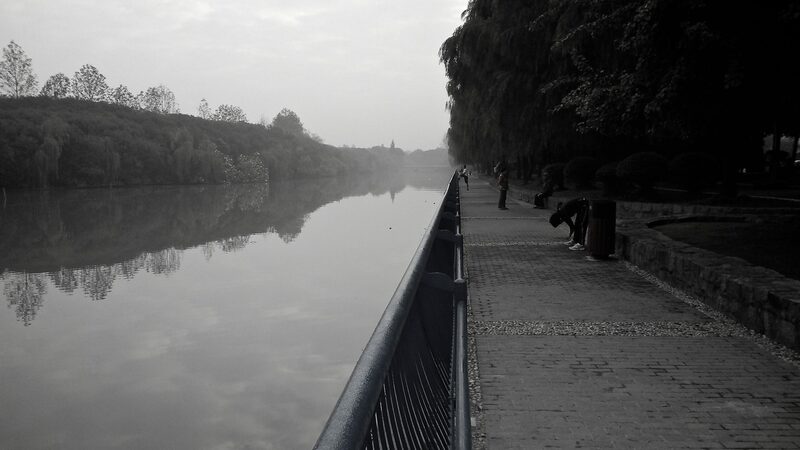 a few hundred kilometres south west of Shanghai. Staggeringly scenic, said the guidebook. Ancient bamboo forest with contorted pine trees disappearing into the mist. I was set. The concierge helpfully booked me onto the sleeper train departing late one evening at the end of the week. The tickets arrived the next day, but had been booked into a ‘hard sleeper’. Another trip to the concierge to explain this soft southerner would really rather a ‘soft sleeper’. The new tickets arrived the next day. A bargain at $40 one way. The night train departs from the colossal Shanghai Station and takes a winding route through the night, initially going north through Suzhou and Nanjing. I settled down in the little sleeping car. Glad not to be suffering a hard sleeper. The next morning the night train terminates in the smallish town of Tunxi before disgorging its passengers into an animated square outside the station. I’d slept well. I’d washed and cleaned up on the train, but was by now in desperate need of coffee, with the beginnings of a thumping headache from caffeine withdrawal. Tucked away in Tuxi old town – my Rough Guide on my kindle informed me – was a charming coffee shop serving real imported coffee. So I hiked into town. Restored after perhaps the best coffee this side of Milan I headed back to the station to take a tatty old minibus up to the foothills and the small town of Tangkou, which serves as the basecamp for the mountains. I arrived late afternoon in beautiful autumnal sunshine. Even in the sun, Tangkou’s new town is pretty brutal – with charmless concrete buildings lining the main drag. The old town, a little further up the road is more rustic and somewhat more basic. I checked into a cheap hotel and bedded down for the night. The next morning the weather had changed. The rustic old town that was, in sunshine, mildly interesting was now cold, muddy, rural and basic. Again, I set out to find coffee. In China, the smaller the town the harder the task. Starbucks might be ubiquitous in Shanghai, but Shanghai felt a long way away from Tangkou old town. To the best of my knowledge the only place serving coffee in Tangkou was ‘Mr Cheng’s restaurant’ on the main road. I know this because – with the help of Google translate – I asked a lot of people in my search for caffeine. It was only marginally warmer inside the little restaurant than out. The rain poured down. I pulled out my maps and guidebook and wondered how long I could wait-out the weather sipping, by now slightly more mediocre coffee. A man I took to be Mr Cheng was friendly and spoke good English. Perhaps the only one in the town. He thought the weather had drawn in for the week. I was pushed for time and had to be back in Shanghai later in a few days, so made a snap decision that I’d have to run the mountains that day – rain or no rain. I didn’t to come this far not the summit the mountains. For a handful of yuan Mr Cheng offered to drive me to the trailhead. I sprinted back to my hotel, changed in record time, grabbed a wad of cash, a bottle of water and my Goretex. Fifteen minutes later I was being driven through the driving rain the start of the trail. I had only briefly read further down the guidebook – past the section on the mystical beauty of Huang Shan. So beautiful are the mountains, the guidebook went on, that it is the ambition of every Chinese to conquer it…. don’t expect to climb alone, it said…. depressingly like visiting an amusement park. I was arriving in late November, well outside the peak season so the paths were at least quiet, but the entrance fees were still steep. I’d have been happy to have just paid a dollar and a half. In all I must have paid around $50 just to run on those paths. I understand it costs for the upkeep of the park, but it still grates to have to pay to experience nature. And so I ran. The first couple of hours took me through the bamboo forest to Yungu temple. With my head down and hood up in the driving rain, I’d perhaps not been paying enough attention to my surroundings. So it clearly came as a surprise both to me and the troop of baboons who were sat eating in the middle of the path. As I ran around the corner I almost charged straight into them. In a storm of shrieking – from both them and me – they scuttled off in every direction and I backtracked, looking for something with which to defend myself. Being rather alarmed that I’d somehow gotten in-between the baby baboons and their mother, I thought I was going to get a beating. As calm descended, I realised I’d not had any rabies jabs and that given any closer encounter I might have struggled to get quick enough access to decent medical care. So I paid more attention to what was around me. Peering through the forest, through the clouds and driving rain. I wasn’t expecting to get much of the famous views. The paths in the park are impressive. Stone steps lead all the way up to the summits. Running up them was tough. Laying the stone slabs all the way up to an altitude 1800 meters must have been a herculean task. I was running without a backpack so stopped at the little stores that lined the paths to buy water and coke. And once an ingenious self-heating boil-in-the-bag rice meal. It had been cloudy and wet all day. And then, as I worried it was getting late and would soon be getting dark I decided to find the path home. There was then, for a brief second, a gap in the clouds. The peaks in the distance came into view. I was suddenly alone on the mountain and gobsmacked by the view. For a few brief moments I was in awe. They may have put all the trees in a museum. It may have been an outrageously expensive way to experience nature. They may have built an extraordinary ugly town at basecamp. But they hadn’t yet paved paradise. With that the clouds closed in, the rain started up and I turned to run the 15km back down hill to the entrance. And then ran another 5km back into town to avoid the need for the Big Yellow Taxi.